..UPDATED: 7/30/10, VERSION: 2.0.2 -- RATING: 4 Stars.. Developer Snapshot: "Normal chord dictionaries tell you which notes belong to a particular chord, but this app works the other way around: you select the notes and Reverse Chord Finder Pro tells you which chords match those notes." Here's why I like this very useful app. Oftentimes I am playing notes that really sound good together. I know they are equal to a chord, but I'm not sure which one. In that case, I will simply plug those notes into Reverse Chord Finder Pro to find out what I'm actually playing. It couldn't be simpler for me, or for students to study chords and also learn new ones. I would definitely recommend this helpful app to anyone who has an interest in writing or learning music. Reverse Chord Finder is the iPhone music app that makes writing and performing awesome music with your friends that much easier! --OS and Age Rating: This app requires iOS 3.0 or later. iOS 4.0 Tested. Rated 4+. 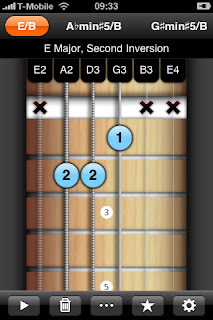 --Tip/Tutorials: Reverse Chord Finder Free is also available on the App Store. ------------------------Fun Stuff - Word of The Day: mozilla - An open source Web browser designed for standards compliance, performance, and portability. It was the original version of the Netscape browser and now Firefox is Mozilla's next-generation Web browser.